Kelvinbridge (Scots: Kelvinbrig, Scottish Gaelic: Drochaid Chaol-Aibhne) is the common name of the Great Western Bridge, a cast iron road and pedestrian bridge built in the 19th century to carry the Great Western Road (A82 road) at a high level across the River Kelvin. 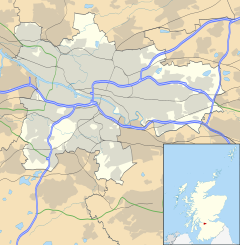 West End of the city of Glasgow, Scotland. The river lends its name to its surrounding area at several points along its course (Kelvindale and Kelvinside for example) and so there are indeed several 'Kelvin Bridges', including one in Torrance. Kelvinbridge is also used to refer to the area in the neighbourhood of the bridge, encompassing parts of the districts of Woodside, Woodlands, Kelvinside and Hillhead. This article is about the bridge across the river Kelvin. For a measuring instrument, see Kelvin bridge. In the early 19th century, the Great Western Bridge provided a crossing point across the boundary of the city and into the neighbouring town of Hillhead, which was incorporated into the city later. Adjacent to the bridge is Kelvinbridge subway station on the Glasgow Subway - one of the deepest on the circuit due to the proximity of the river - on the south east side of the bridge. This was also the location of Kelvinbridge railway station on the Glasgow Central Railway. Nearby is the Glasgow Academy private school. Due to the vicinity of the University of Glasgow, the district accommodates many students, cementing its place as part of the West End of Glasgow.